We here at Luv-A-Rug have theme days when it comes to area rugs. Not everyday, but most days. Today was Persian area rug day. 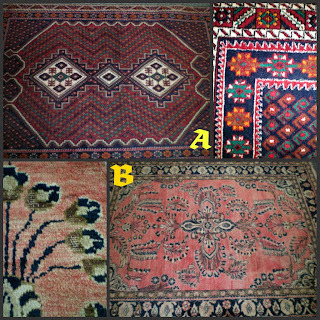 We got four Persian area rugs from three different clients in an hour's time frame. We actually have had a lot of Persians come in to Luv-A-Rug in the last 10 days. Here are the four Persians that came in today. I have the pictures set up so you can see most of the rug and beside it is a close up of an interesting detail about that area rug. In pictures 'A' I enjoy the all over pattern, but I really like the teal in the border. In pictures 'B' the Persian is very faded and very loved. The brown wool has worn away faster than the other colours. The brown dye is more acidic than the other colours on this rug and that is why it wears faster. In pictures 'C' I again love the teal detailing. It is such an under used colour so I am always drawn to it whenever I see it on a rug. Plus I really love teal. Pictures 'D' also has a little bit of teal in the border. I took a picture of the back to show the fineness of the knots. 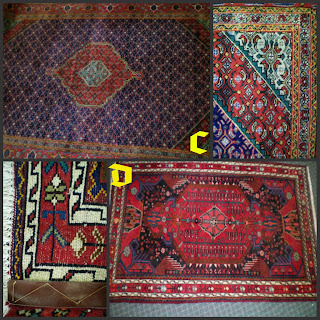 Both C and D are Persian Heriz area rugs.